Like millions of other Americans, I'm trying to lose a little weight and get into shape now that the holidays are over. Praying that this will last longer than the month of January! 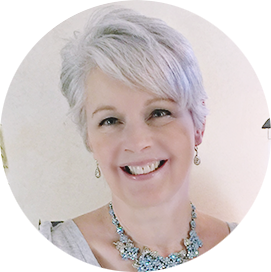 Sugar and white flour are the big stumbling blocks in my own weight management program. It's difficult when I feel that home-baked goodies with tea is synonymous with cold-weather comfort. I actually find it easier to avoid sugar and flour altogether than to find substitutes, but today I made up these gluten-free scones, made from a mix my nephews sent me at Christmas. I made them in anticipation of book club tonight, since so many of my friends are gluten free. Of course, I had to sample one to make sure they were okay! Isn't this forelle pear beautiful? If you look closely, you can see they're smiling at me with approval because I've chosen to have a healthy tea! I'm having tea today with the lovely ladies over at Sandi's Rose Chintz Cottage. Deborah, yes the pair is beautiful, but that scone looks delish! How did they turn out? 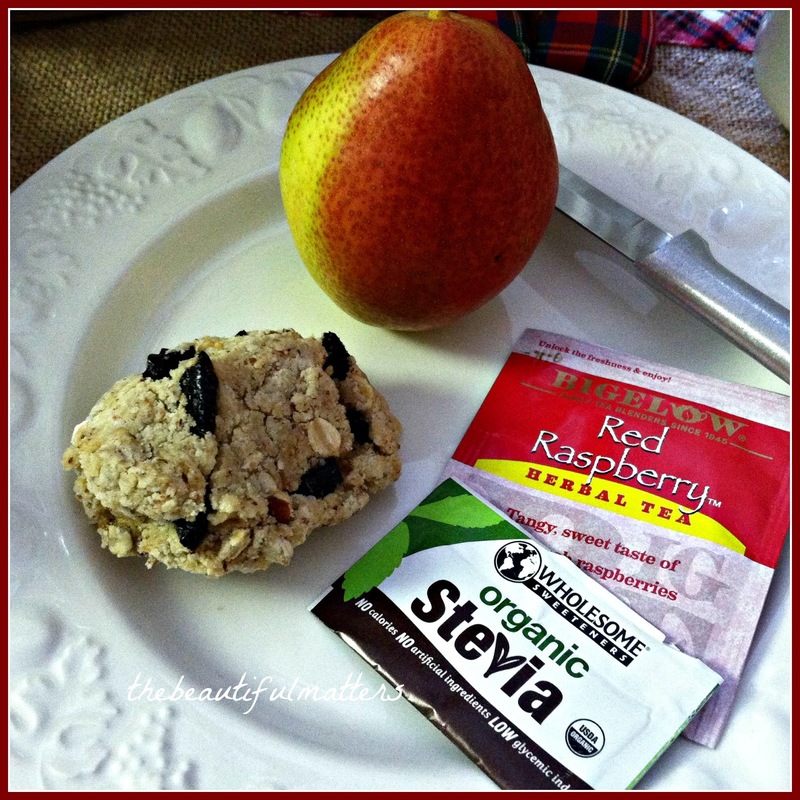 I love scones, and if you think it was good, please share the recipe, maybe in a future post? Enjoy your book club meeting, and stay warm! Looks healthy! I agree with you on how mandatory it is to test food (especially goodies) before serving it to guests! I cut back on my breads a year ago and have found that it really helps. I did however do more baking for Christmas and there is still lots of it around. I'm doing not too badly leaving it alone though. 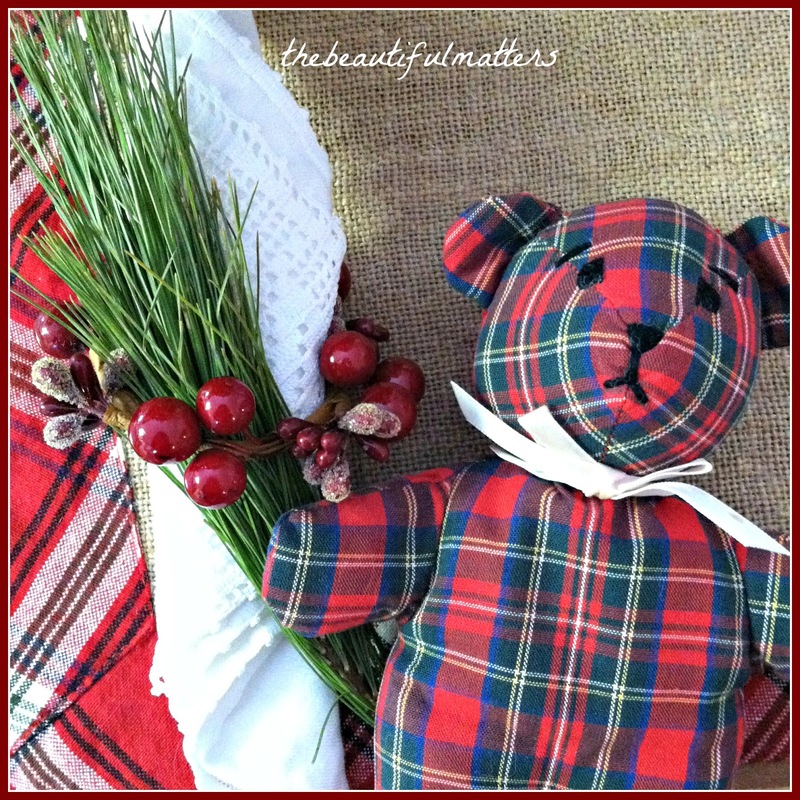 The tartan teddy bear is so cute and I like your white tea ware. Thank you for sharing and joining me for tea. I too am looking for healthier options these days. Looked delicious. I'm trying to lose a bit of weight too! Good luck. Good for you for trying to be healthier in 2015. I also need to eat more fruits and exercise more often this year. Best wishes as you embark on healthier eating! It is worthwhile, although not easy. Take it one day at a time and never beat yourself up. The pear is indeed a beauty, and so is the scone. I really enjoyed your post today. Have a good week! Thinking of you, sweet friend! Your healthy tea looks wonderful and satisfying. 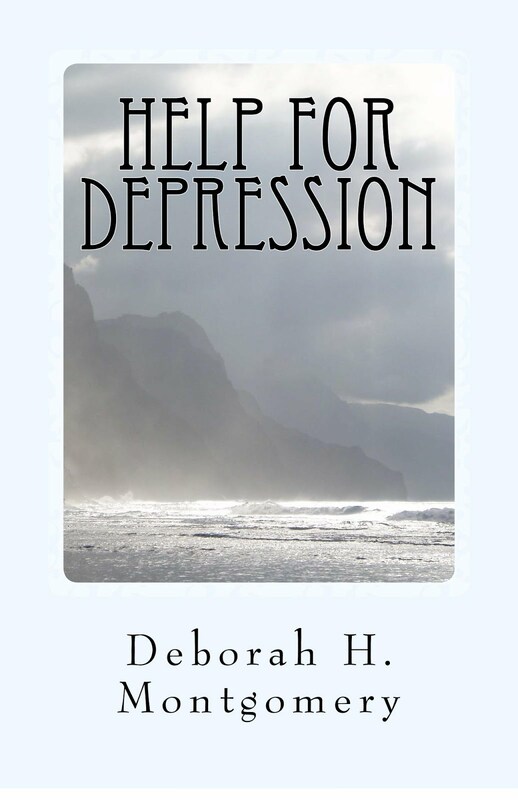 Hugs to you, Deborah! Oh my goodness! 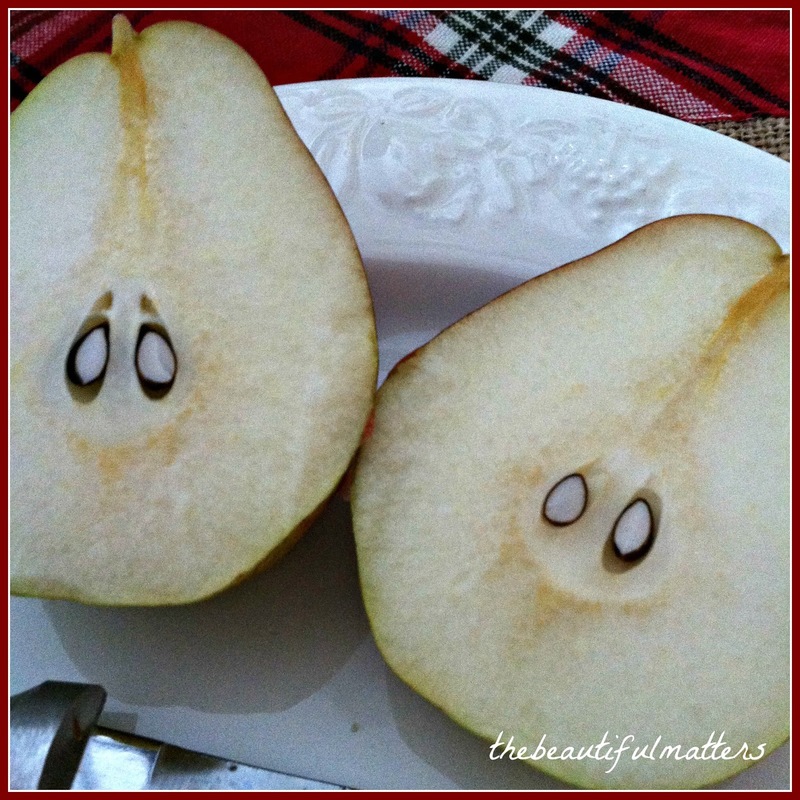 Yes those pears are giving you a gorgeous smile sent right from God. He blesses our obedience, doesn't He? I find I do better with out sugar and white flour, in many ways. Have a beautiful week, Deborah. I think that little bear is adorable. I have a real fondness for teddy bears. Hi Deborah, the pear looks so delicious and the sconces look like the perfect treat to go with winter tea. I have been gluten free for nearly 3 years now and doing great. Best of health to you watching out for flour and sugar. It really does make a huge difference in how we feel. Lovely! 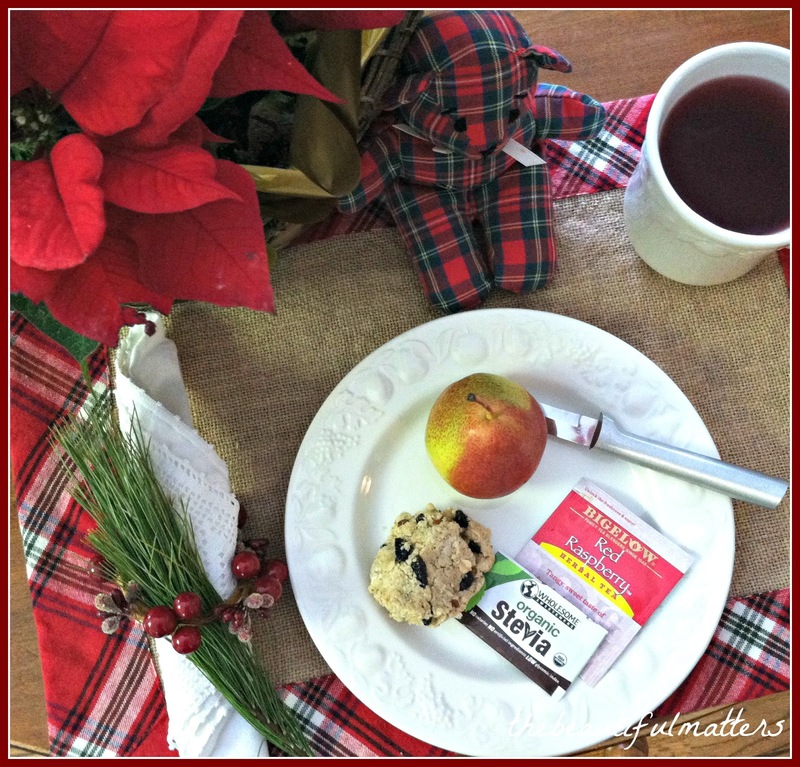 I love the idea of shooting for a healthier teatime treat! Also, a book club,how fun!!! 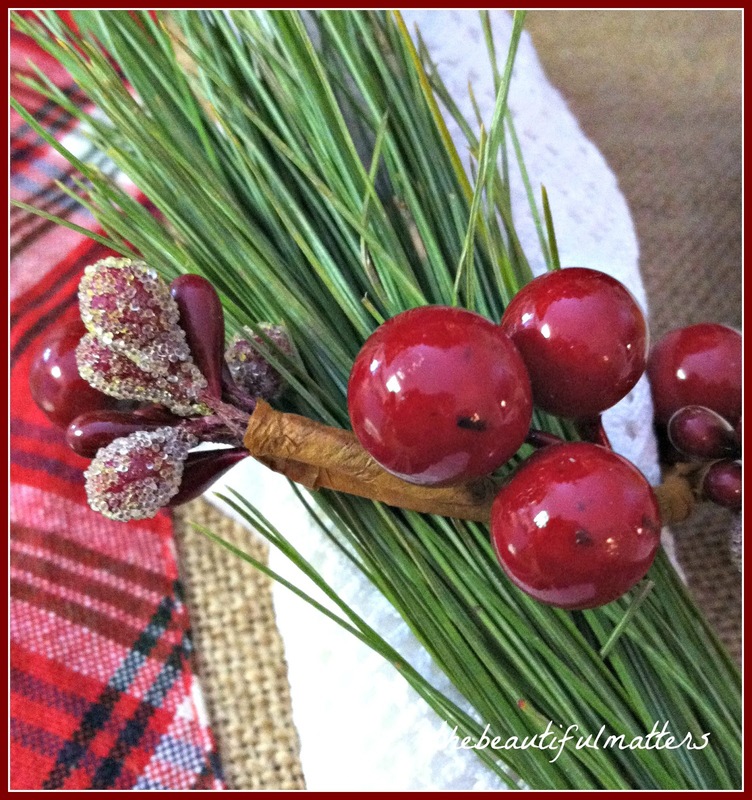 Thanks 4 sharing such a lovely blog!!!! 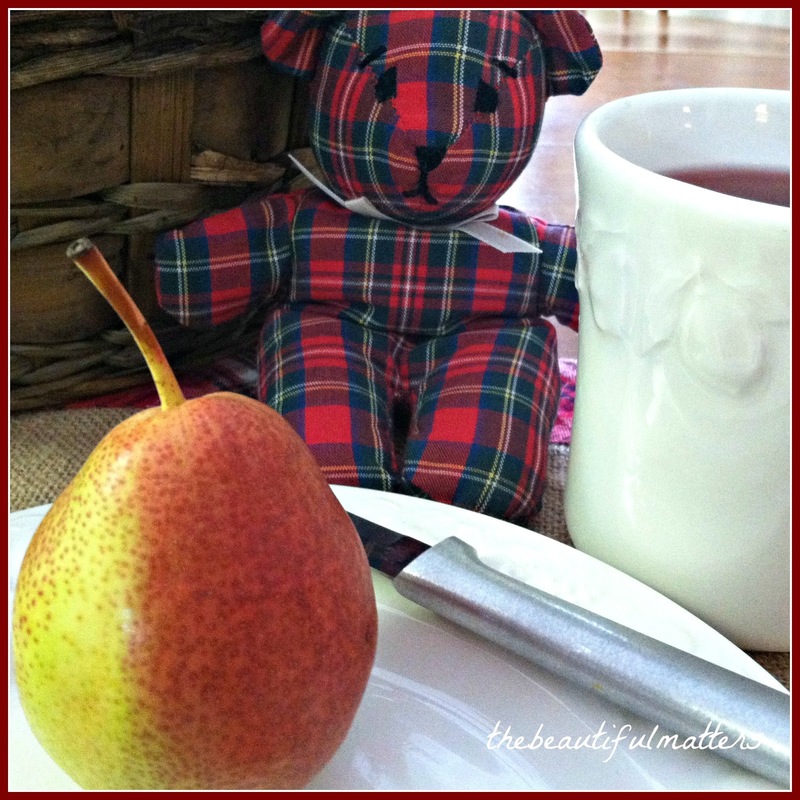 Tea, scones and pears sound sound so nice and perfect on these cold days of winter! Enjoy the rest of the week.